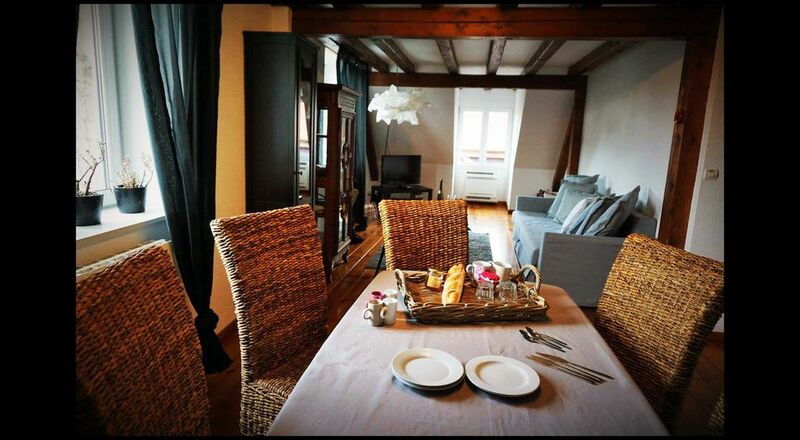 Opaline cottage is a cottage of 75m ² for 5-6 people located on the first floor, in the attic of the wine cellar ZEYSSOLFF. It has an individual electric heating. Its exposed beams combined with red and black tones make this apartment an authentic and modern cottage. It has a small entrance with a stove. A living room with TV and DVD player, sofa and armchairs invite you to relax. A fully equipped kitchen is at your disposal. 2 independent bedrooms are each composed of 2 beds. 1 independent room is composed of a sofa bed and a library. A bathroom with shower. A bathroom with bath and toilet. Plus, independent toilets. At the foot of Mont St Odile, halfway between Colmar and Strasbourg. Lodging in wine estate, in the heart of the vineyards, located on the 1st floor. Access via independent entrance street Gutbrod. Closed court. Electric heating and air conditioning included, charges and taxes included. stove (wood available for free). Free WIFI. Non-smoking cottage. No pets. Sofa and 2 armchairs, TV, DVD player, mini-chain, 1 large table and 6 chairs. 4 ceramic hobs, oven, microwave, fridge-freezer, dishwasher, food processor, blender, kettle, toaster, coffee maker, raclette grill, grill and crockery. Maximum capacity (6), Sheets provided, 4 bed (s) 90 x 190 cm and 1 sofa bed 140 x 200 cm. Shower, bath, 2 single basins with cupboard, toilets in one of the bathrooms + independent toilets. Flat screen TV, TNT, DVD player, mini radio and CD channels, fan, iron and ironing board, hair dryer and vacuum cleaner. 1 bottle of wine offered on arrival, cellar visit and free tasting during the stay, kit Bacchus available (necessary for tasting: pulls pro caps, carafe to decant, reviews on wines ...). Garden lounges and barbecues in the common courtyard, large private parking not closed nearby. Sheets provided with 4 beds and sofa bed, and beds made on arrival. Bath mat and kitchen towel provided. Cleaning not included in the price (60 €), optional baby kit (bath, high chair and cot) (10 € per week), Towels (1 bath towel, 1 towel and 1 washcloth) optional : 5 € the week. Extra bed and sheets on request and extra. In barr, at 2 kms, are also the restaurant of the manor with its small Alsatian dishes as well as the restaurant of the sun. A lingerie common to all the cottages is at your disposal free of charge, in which you will find a washing machine, a tumble dryer, drying clothes, a table and an iron, outdoor games (bowling, snowshoeing ...) for children. We've had a nice stay in a very cosy flat. Celine was a really helpful host. Everything was well prepared and organized.